Mahdi says that the studio planned to use the first episode as a preview of their entire Garuda Riders series of games. The team gathered lots of feedback from its users and implemented some of those ideas into the following episodes. These new elements stalled the second episode’s release by a few months. How improved is the second episode now? Mahdi explained that, story-wise, there aren’t too many differences. But there are things like more story pages, more of the Garuda Riders musical soundtrack, and overall improvement of user experience as requested by the gamers. The Chosen One comes in two languages: Indonesian and English. Mahdi tells us that there will be a Korean and Japanese version of the app released in the coming months. Garuda Riders’ first episode now has a Japanese version on iOS thanks to cooperation with Japanese software developer Deluizon. The first episode has racked up around 3,800 downloads so far. This decision to push into the Korean and Japanese markets makes a lot of sense too, seeing that developers can seriously monetize their apps there. The iPhone version of the two episodes’ international versions will arrive in the coming months. 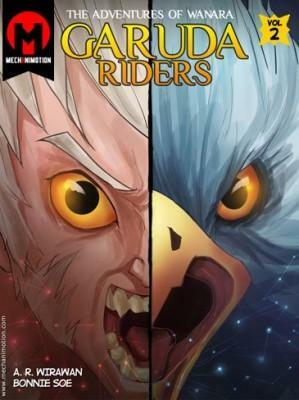 You can download Garuda Riders’ latest episode on Google Play for US$0.99 or the Telkom Store for US$1.12. The post Indonesian Digital Comic Game Wanara’s Second Episode is now Out on Android appeared first on Tech in Asia.